The new "Auto Picture Creator" window is usually docked at the left side of the Diamond application window and offers the most useful features in the categories picture building, picture design and picture viewing at a glance. Its starting position and handling is similar to the Navigation window, which you already know since Diamond version 3.0. Like that it can be docked, floating or completely hidden. Additionally it can reduce its size to nothing but the tab -- enabling quick reappareance when mouse over. This is useful when your screen size is limited due to open data sheet or other windows or panes. The activity status of the Auto Picture Creator is signalled with the yellow-orange field in the middle of the status bar. The "proposed picture building" settings are automatically filled into the "Auto Picture Creator" docking window's controls. So you have a starting point to adjust the settings to override what Diamond has suggested. 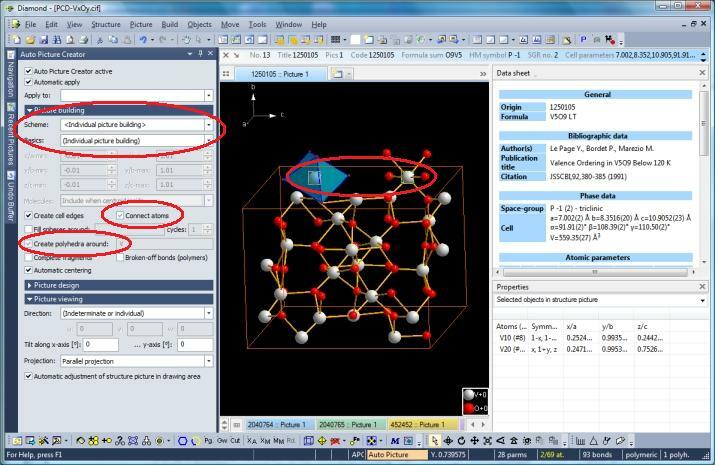 You can simply switch "Connect atoms" on or off, add or remove polyhedra, or increase or decrease the cell range. After adding polyhedra and removing the "broken-off bonds" option, the "Scheme" control gets blank, because this is not more what "proposal" originally intended to be. The usage and activity of the Auto Picture Creator does not prevent you from using the dozens of functions in the Build menu to build up a picture. The Auto Picture Creator tracks your manual changes and tries to update its settings. 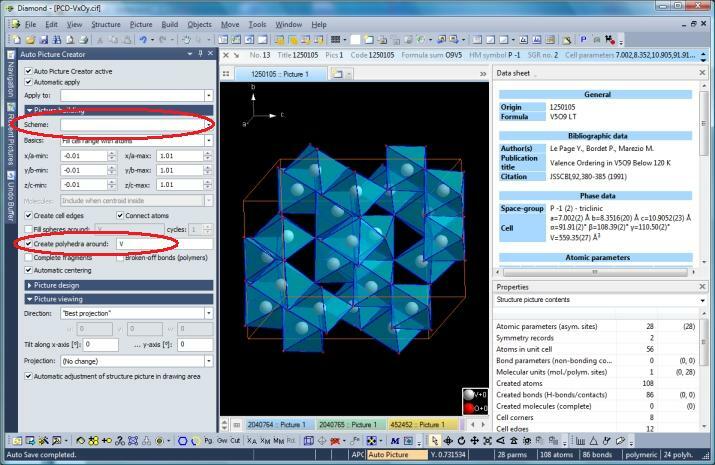 This has of course limitations when you successively attach cell ranges to the originally chosen basic cell range or add spheres to atoms that you selected with a mouse click, the Auto Picture Creator switches to "Individual settings". After removing the "Create polyhedra" checkmark and adding coordination spheres to two V central atoms (manually with mouse click and pressing the corresponding icon in the toolbar) and adding a polyhedron to one of them, both "Scheme" and "Basics" change to "Individual picture building". This is because the set of Auto Picture Creator functions cannot depict your special choice of atoms for coordination spheres and polyhedra. 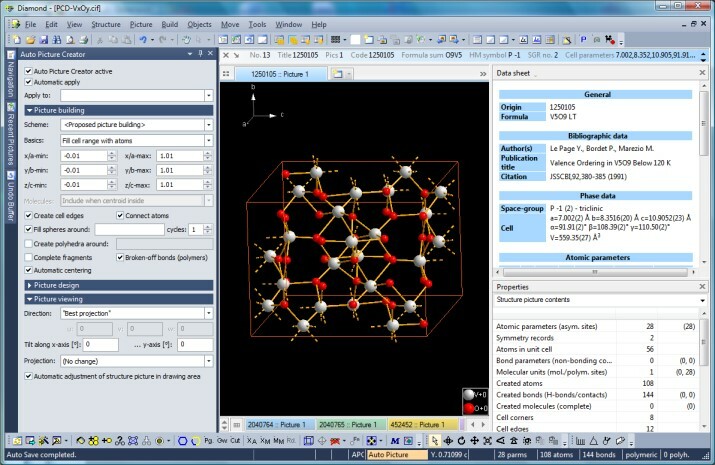 Note that "Connect atoms" and "Create polyhedra" are grayed. You can click on "Create polyhedra" again to create polyhedra around all V atoms (picture below) or remove all polyhedra with a second click.